For those who like to marvel at a sky full of stars and find constellations there is the planetarium in Prague 7. Located in the park Stromovka it is popular with families and children. The planetarium was founded in 1960 and festively opened for public on the 20th November 1960. At that time, it was one of the most technically advanced in the world, and until today it is still one of the largest. 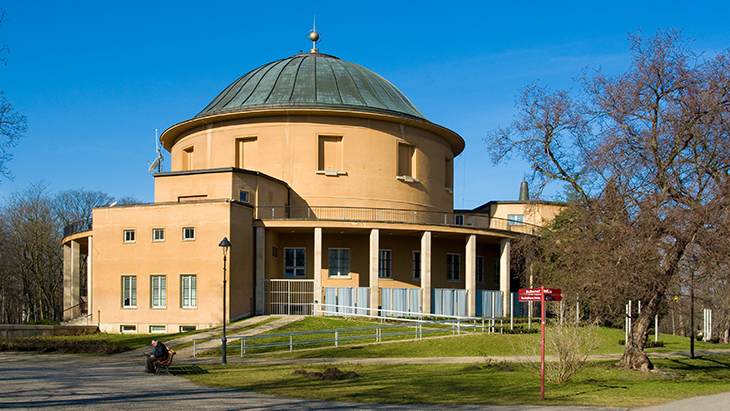 Since 1979, it has been a part of the Observatories and Planetarium of the Capital City of Prague (together with Štefánik’s Observatory at Petřín and Ďáblice Observatory). Today, there is an apparatus in the astronomical hall - it is controlled by a computer system named Kosmorama, which contains 230 projectors, 120 projecting bulbs, and they are driven by 16 engines. It can display the sky as it looked at any time in the past and as it will look in the future; it can even simulate all types of the eclipse of the Sun and the Moon, it can display the comets, etc. There is also a new wide-angle, full-sky and panoramic projection and new laser projection system, so in the cinema hall Starvid you can watch top quality video projection or the projection of slides on the largest projecting surface in the Czech Republic (843 m2). There are shows in English; you will get headphones with the English translation. The closest metro station is Vltavska (red line C) and the closest tram stop is Vystaviste. As for the ticket prices, regular shows in Czech are between 60 - 160 CZK and shows with English translation between 160-200 CZK. The planetarium is open daily with the exception of Friday; weekdays from 8.30 a.m. till 6 p.m., Saturday from 10:30 a.m. till 8 p.m. and Sunday from 10:30 a.m. till 6:00 p.m.